After fighting off a cold all week, it has finally caught up to me. I'm grateful that it waited until the weekend, so I didn't have to miss work... but I'm also ready for it to be over with! To speed up that process, and to keep dinner prep simple, I decided to make a slow-cooker soup. 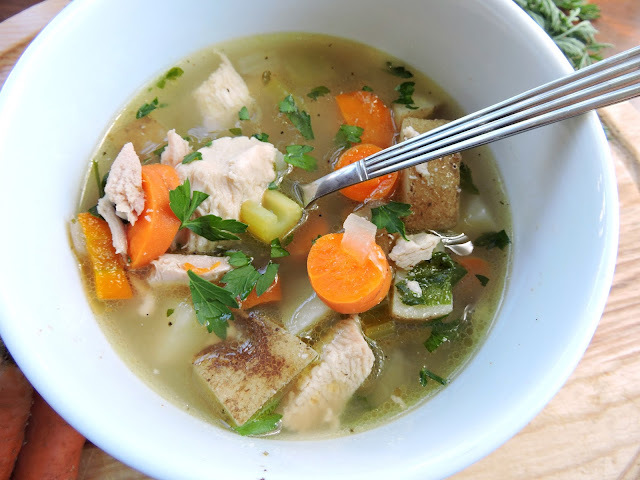 I have a Stovetop Chicken Soup recipe that I posted awhile back, but have been meaning to come up with a simple crockpot version for nights that I don't feel like hanging out in the kitchen. 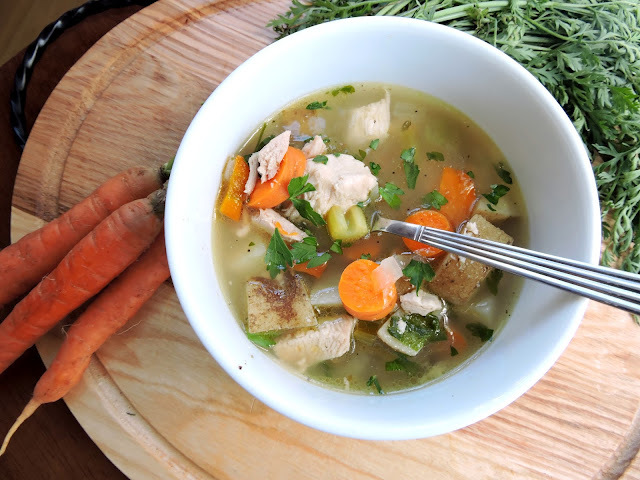 The nutrition from the bone broth, and overall comforting flavors of this soup totally hit the spot. I love how the potatoes & carrots cooked up perfectly without getting too soft, and the fresh parsley gave it a little extra life at the end. To make it extra perfect, you could bake up a batch of my Paleo Drop Biscuits to go with it! And, to give you an idea of just how filling this is-- a large bowl of this was enough to fill up Dathan (who always has a big appetite)! I like a really dense soup, but you could easily double the broth or add less of the meat and veggies to thin it out a bit. *I used about 1 1/2 lbs of chicken (3 breasts, 4 thighs)-- but you could use whatever cuts of chicken you like, or even throw in a whole chicken! 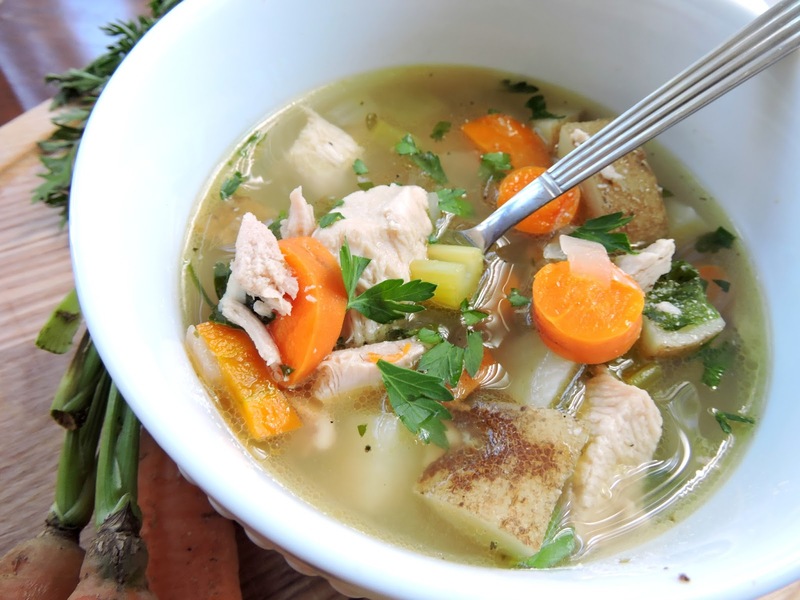 Fill the slow cooker with chicken and veggies (potatoes, carrots, celery, onion), and cover with bone broth and water. Add the seasonings (garlic, oregano, salt, pepper) and bay leaves. Remove the chicken and chop into bite-sized pieces (discard bones if you used a whole chicken). Pull out the bay leaves and discard. Return the chopped chicken to the slow cooker with fresh parsley & grassfed butter (optional-- gives it a rich flavor & boost of healthy fat). Add additional salt & pepper to taste, and continue to cook for 10 - 30 minutes, or until you'r ready to eat. Spoon the meat & veggie mixture into bowls and top with broth. Enjoy! Makes 8-10 hearty bowls of soup.